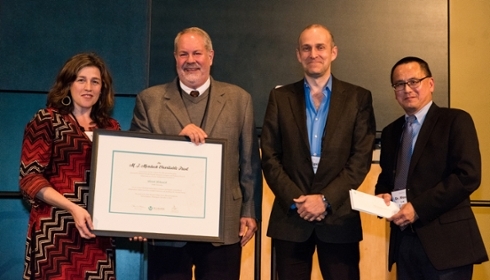 Prof. Schaack accepts a Murdock scientific promise award in Spokane, WA in November, attended by Dean Nigel Nicholson and executives from the foundation. Prof. Schaack, a genomist, was recently granted tenure. In 2012 she was awarded a grant by the National Science Foundation (the Faculty Early Career Development Program— CAREER—Grant) and was a 2013–14 Fulbright Scholar working in East Africa where she coordinated a genome sequencing project with collaborators in Nairobi and Kenya. 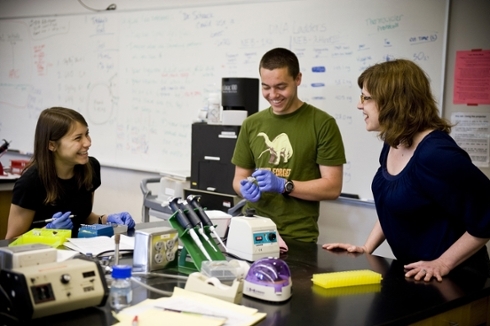 She teaches many courses including introduction to biology; genes, genetics and genomes; and mobile DNA. Schaack is known for her dynamic teaching style in the classroom and outside, and for taking students on off-campus research trips in the U.S. and East Africa.